A new set of innovative construction technologies recently unveiled by an Austin-based startup could wind up giving people around the world safe and affordable homes — all built with a new type of construction material and a tough-as-nails 3D printer. In fact, the company called Icon recently unveiled a showcase tiny home built in partnership with a local nonprofit called New Story that proves it can build a fully outfitted 350-square-foot home, on site, for a fraction of traditional construction costs. 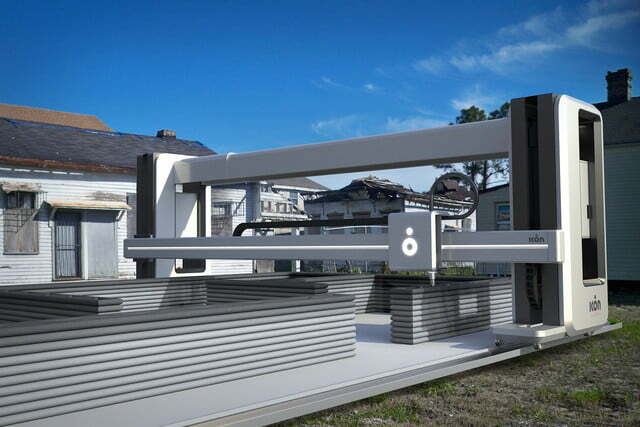 The prototype they built with New Story, a nonprofit whose mission is to research and design breakthroughs for the housing sector, is the first fully permitted 3D-printed home in the country. Icon’s approach is well-backed — the company closed a $9 million round of funding last year — and the company plans to start building homes around the world this year. But it’s not just its deep pockets that set it apart; it’s the award-winning technology and a futuristic new building material that enable Icon to build affordable homes quickly. Icon’s advantages are many but the two that catch the eye are the keys to changing how houses get built, anywhere in the world. The first is a proprietary new material akin to concrete or mortar that the company has cleverly dubbed “Lavacrete.” This is the material that enables Icon to “print” homes on site. The developers say this unique material has passed every structural test they’ve put it through. The Vulcan II has a lot of bells and whistles including tablet-based controls, remote monitoring and automated material mixing, pumping, and delivery. However, what makes this 3D printer more interesting than competing devices is that it has been designed to work in the real world, in harsh conditions. Using the Vulcan II, Icon and its partners can tackle housing shortages in places like Haiti and rural El Salvador where unpredictable constraints like limited water, power, and labor might cripple a more sophisticated device. New Story plans to use the technology to build homes for underserved families in El Salvador, while Icon is working to bring home construction time down under 24 hours.